It has come to my attention that many of you just don’t know who we are and what we do. Well, we just can’t have that can we? In a nutshell, we are located at 1555 Knowles Road in Headland. We are a family fun farm that caters to all ages and stages. We are open weekends starting the last Saturday in September every year (in this case September 28) and close the last Sunday in October (the 27th). 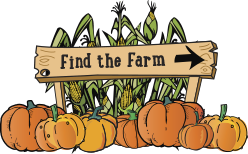 Among our many attractions are a 7-acre corn maze, gigantic jumping pillow, cow train, hayrides, corn box, and corn cannon. That’s not to mention the pony rides and animal barn. Now that we have covered the basics, read on for a more in-depth corn-ography. CornDodgers Farm was founded in 2008 by Eric and Amanda Knight (me) of Headland, Alabama. It is truly Eric’s brain child and had a rather painful inspiration. We went to a corn maze hosted by the Ag College at Auburn one weekend many years ago. It was dark and we were woefully unprepared, not having thought to bring flashlights. I, being the klutz I am, tripped and sprained my ankle. Eric, being so enthralled with the corn maze concept, wandered off into the corn, leaving some of our friends to attend his injured girlfriend. Romantic, huh? Let’s just say, it’s a good thing my foot was injured when we left. The maze bug never quite left Eric and over the years, we would joke about starting a maze of our own. After our first child was born, we started looking for something our kids could grow up in and teach them the value of a good work ethic. Finally in late 2008, we got serious and CornDodgers Farm was born. We had the land, but it needed a lot of work, so we set to it. After a whirlwind of a year, CornDodgers opened in September 2009 with a whopping four attractions–maze, corn cannon, hayride, and corn box–and a small concession stand. Since then, we’ve expanded a bit to include the cow train, jumping pillow, hay and tire pyramids, play area, pony rides, animal barn/petting zoo, and a separate haunted maze that opens in late October. Now, here we are! It is a lot of work to coordinate, but we love it. We try to add something new every year, and this year’s addition will be revealed in the coming weeks. We specialize in something for everyone, be they 2 or 102. Adults and children alike can enjoy virtually all our attractions or just sit a swing and watch the kids play. So give us a try! We promise the kids will be exhausted! For more information, find us on the web at www.corndodgersfarm.com. Also keep up with our Farm Blog for all the latest happenings at CornDodgers Farm! Previous post: How do we do that?